Hong Kong’s democracy debate has put Western businesses on the spot. Hundreds of thousands of citizens are engaged in a public showdown over a new system for conducting elections in the former UK colony. The standoff has prompted questions about Hong Kong’s future as an efficient and well-ordered financial centre. But warnings of potential disruption miss the point. Business leaders are worried about Hong Kong’s “Occupy Central” pressure group, which has pledged to stage demonstrations in the central financial district. Unlike the anti-capitalist movement which shares part of its name, the group is not targeting banks. Its concern is the system for electing Hong Kong’s next chief executive, which is due to be conducted by universal suffrage. China wants voters to choose from a carefully vetted list. Occupy Central wants the nomination process open to the public. Beijing has already dismissed the idea, which more moderate democrats accept is a non-starter. Still, a large number of people have endorsed it. Almost 800,000 voters – more than a fifth of Hong Kong’s electorate – participated in a referendum organized by Occupy Central this month. Hundreds of thousands joined an annual pro-democracy march on July 1. Last week, the Hong Kong affiliates of the “Big Four” accounting firms placed adverts in local newspapers warning that the protests could prompt an exodus of foreign multinationals, a view shared by many other global companies and banks. Such interventions are misguided. Though Occupy Central is not yet underway, there’s little evidence of any financial disruption. The local stock market is unmoved. And Citigroup recently invested $700 million in a new Hong Kong headquarters – the largest sum ever spent on an office building in the city. Global groups like the Big Four also need to consider how opposing a pro-democracy campaign will look to international observers unfamiliar in the nuances of Hong Kong politics. Besides, companies also have other reasons to worry about China’s stance towards Hong Kong, particularly if it threatens the city’s cherished independent legal system. On the same day the accountants placed their advert, about 1,800 Hong Kong lawyers staged a silent protest to signal opposition to greater intervention from Beijing. Business leaders should reflect that the right to mount a peaceful demonstration is an integral part of the system that makes Hong Kong, and its embrace of the rule of law, a magnet for commercial activity. Protesters sing while waving mobile phones during an overnight sit-in at a street at Hong Kong's financial Central district July 1, 2014. Hundreds of thousands of pro-democracy protesters marched in Hong Kong on July 1 in the biggest display of public disaffection for more than a decade. The protest came after more than 790,000 people participated in an unofficial referendum organised by Occupy Central with Love and Peace, a movement which is pushing to open the nomination process for choosing Hong Kong’s next chief executive. 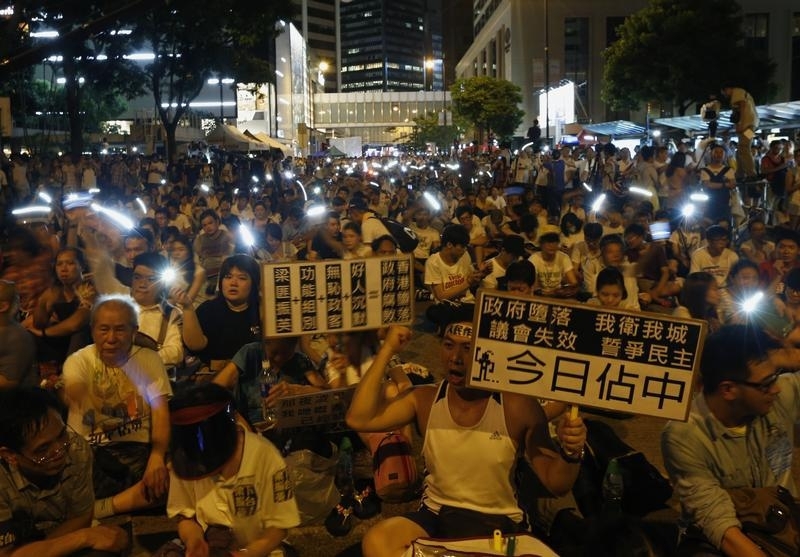 Police arrested more than 500 pro-democracy protestors on July 2 after they staged a sit-in Hong Kong’s central business district after the march. The Big Four accounting firms on June 27 placed adverts in Hong Kong newspapers urging organisers of Occupy Central to resolve disputes through dialogue rather than disruptive protests. “We are worried that foreign multinationals and investors will leave their Hong Kong headquarters because of this, or even withdraw their business, and shake Hong Kong’s place as an international business centre over the long term,” read the ad that appeared in three Chinese-language newspapers.